This winter has left many of New Jersey’s streets in a state of disrepair. Poor road conditions can cause motorists to make unpredictable hazard avoidance movements, increasing the danger for other road users, including other motorists, bicyclists, and pedestrians. While automobiles may be damaged due to poor road conditions, the risk is even greater for bicyclists who frequently use roads because bike path networks are still in their developing stages. For these users, hitting a pothole can lead to a severe injury, or worse. The state designates a page on the NJDOT website for pothole and highway maintenance that allows residents to report road damage or safety issues such as potholes, tall grass, sign problems, or roadway debris. However, this page is used primarily for roadway complaints and acts more as a service for automobile users. Fortunately winter has passed, and as it gets warmer, more pedestrians and bicyclists emerge and begin to notice some of the damage this past winter has left. They, too, need a way to express the conditions along their commuting paths. One way to address this disparity is through community-based mapping, also known as participatory mapping. It has been used across various disciplines including natural disaster alerts, traffic updates, and more recently, urban planning. Community-based mapping is centered on local participation through cartography tools such as Google Maps or GIS. Through this system, anyone with access to any selection of smartphone applications can report on storms, traffic conditions, or road quality. 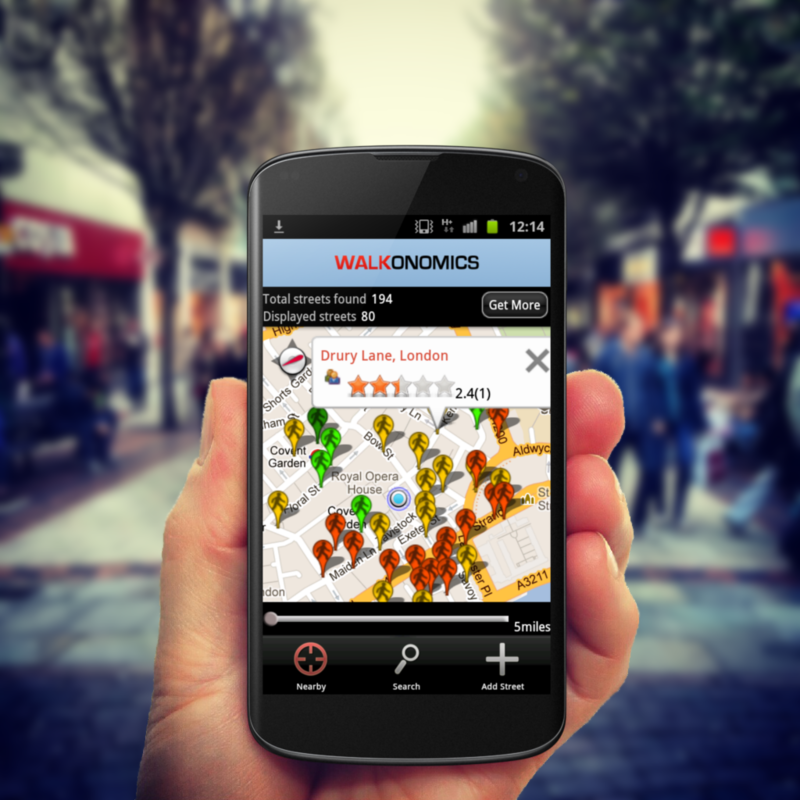 Walkanomics is a new application for mobile devices that allows people to rate pedestrian-friendliness along streets in select locations. This app was released in early 2013 and is relatively new, only available in four cities: San Francisco, New York, Toronto, and London. Walkonomics was developed by Adam Davies, in order to provide local community residents with an outlet for improving their street systems. The app has 8 categories with ratings of one to five stars: road safety, easy to cross, pavement/sidewalk, hilliness, navigation, fear of crime, smart and beautiful, and fun and relaxing. Respondents can use their mobile device’s GPS system to pin the location (and street) they are rating. An average user rating is determined and expressed by colored place markers on a map, ranging from green (good) to red (bad). This app not only provides residents with information on their cities, but can also assist cities in identifying areas unsafe for pedestrians and bicyclists. Soliciting public input and opinion is an important component of any planning effort, including transportation planning. Holding public meetings at 5:00 pm on weekdays severely limits the general public’s ability to attend these meetings. This gives some residents a disproportionate voice during public meetings – a voice that is not necessarily representative of the greater population. Providing an interactive website or participatory application, such as Walkanomics, enables planners and decision makers to reach a segment of the population that is ordinarily under-represented at community meetings. As the technology advances, so too do the tools available to planners. The Ambassadors in Motion are the Department of Transportation public outreach team. These new technologies, however, only represent a part of any successful community outreach effort. 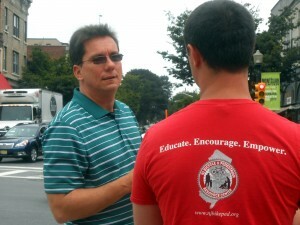 Grassroots, “boots on the ground” outreach remains the most viable way to reach any population. The Ambassadors in Motion have spent the past two summers traveling to New Jersey communities to bring awareness of bike and pedestrian safety issues and the Complete Streets movement. In addition to outreach, our data collection efforts have included walkability and road safety audits, as well as directly engaging the community about how to better serve them. High bike and pedestrian crash municipalities, like Newark, Paterson, Trenton, and Jersey City, have been targeted as we seek to involve and represent all New Jersey residents in the transportation planning process. The key to any successful planning effort is public participation. The tools available to planners for this engagement are evolving along with technology. While these new tools present new opportunities, the best way to reach the public remains direct, face-to-face communication and data collection. Combining these approaches broadens the populations represented in these outreach efforts and improves the results of community engagement. This engagement leads to more public involvement and support for projects, which can lead to a quicker and smoother implementation. By utilizing new tools while maintaining a direct line of communication with residents, planners and decision makers can improve not only the outreach efforts, but the products that develop out of them. Posted on April 17, 2014 by njwalksnbikesPosted in Bicyclist and Pedestrian Safety, Community EngagementTagged mapping technology, NJDOT, Walkanomics.